For years, rumors have swirled about the NFL coming to Canada. The league has tested the waters since as early as 1959, when American teams faced off with the Canadian Football League in Ottawa and Montreal. In the 1990s, the American Bowl brought NFL teams to several cities outside the U.S., with the Buffalo Bills playing two preseason games in 1995 and 1997 in Toronto. Located so close to the Canadian border, the Bills have historically attracted a large market in Ontario, which has extended and continues to grow to Toronto in recent years. In 2008, the Buffalo Bills inked a five year deal dubbed the Bills Toronto Series in which the team would play three preseason, and five regular season home games at Rogers Centre. Fans packed the stadium for the regular season Toronto home games against the Miami Dolphins in 2008 and New York Jets in 2009. Despite Bills losses, Rogers has been eager to renegotiate the deal for longer terms, and this past Sunday, fans came out in droves again to see the Bills take on the Chicago Bears. 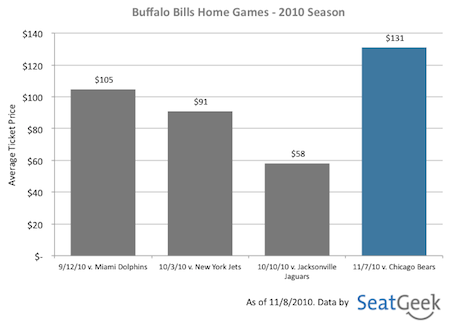 To determine fan sentiment around the Buffalo Bills in Toronto, we took a look at average ticket prices across all home games played so far in the 2010 season. 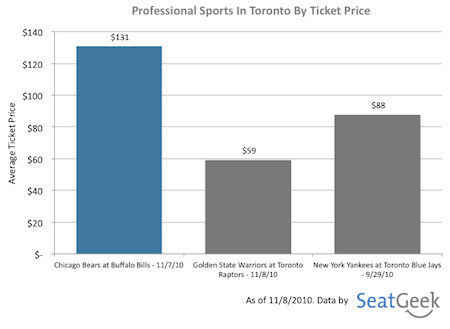 Surprisingly, the Bills v. Bears game at Rogers Centre commanded the highest average ticket price so far. Based on the numbers alone, fan sentiment around the NFL in Toronto looks very strong. Is the NFL more likely to land a team in Los Angeles or Toronto? Tell us what you think in the comments below, or on Twitter @SeatGeek.